Ebby Lee started ballet/tap this summer and has been loving every second of it! I took her a couple weeks ago and couldn't stand it. She looked so stinkin' cute in that little outfit! The kiddos and I took a walk/bike ride around the neighborhood last week. The boys spotted a dog. ha! Smith came over to our house for a SLEEPOVER!! (Ebby Lee went over to Kensington's) The boys were SO good! They played in Nixon's room, they played Lego's, they played with Bowen, and then we made homemade pizzas. These little chefs whipped up their own personal pizzas. I can't stress this enough...they were SO good! I told Shay that Smith can stay with us anytime!! Seriously, they played SO well! Bowen managed to fall asleep sitting up at the pool. How does this happen? Don't we all as Moms have those moments when we think "GOD, AM I DOING THIS RIGHT?". I was totally having one of those days last week. The kiddos and I had been to the pool. After naps we hit up the grocery store for a couple things (my kiddos were super exhausted), it was the kind of trip where the big kids fought over who got to sit in the cart with Bowen and by the end, there was not ONE SINGLE KID left in my cart!! You know the kind I'm talking about, right? A crazy chaotic PLEASE let's go this over with kind of grocery run. I was in a horrible mood pushing my cart to the car. I turned the car on and loaded the kiddos first. Apparently my radio was on (I really wasn't paying any attention), but I threw the groceries in the back. As I put my cart away, I heard the Newboys song, "We Believe" and two little voices in my backseat were singing right along..."We believe in God the Father. We believe in Jesus Christ. We believe in the Holy Spirit. And he's given us new life.". And...tomorrow Andrea and I are having a PARTY!!! 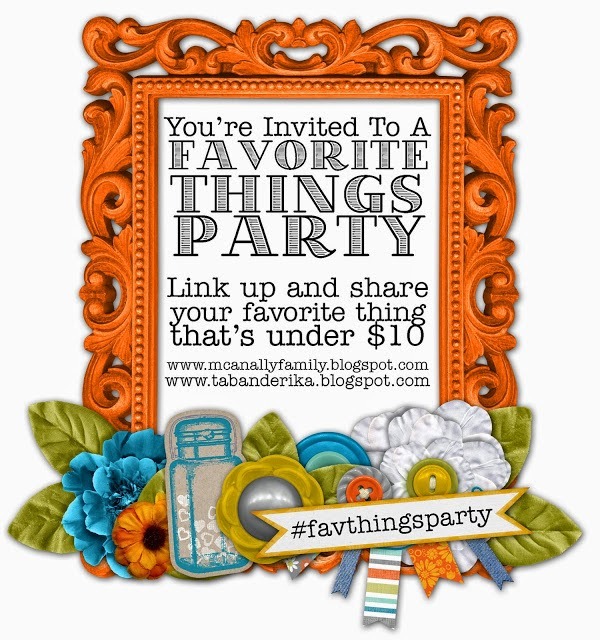 A Favorite Things Party!! Sorry, we usually do this the last Monday of the month, but we forgot to remind you. We thought we'd give everyone an extra day to prepare. If you blogged it today, no problem! Just link up with us tomorrow!! We love getting to see what your favorites are every month!! Girlfriend, you're doing a fabulous job. Your kiddos have the biggest hearts for the Lord and really, that's all that matters, right? And PS: my kids would have been fighting over who gets to sit next to Bowen too. That kid is just so dang sweet :). Such a sweet little story! And mama, you are rockin' it with your three littles! And Ebby Lee at dance? I die. Ebby Lee in that ballet outfit is just adorable! So glad she's loving it! And it never ceases to bring a smile to my face when I hear of stories like this one, when the Lord tests us and then reminds us of His glory, and we remember what's important. Stay strong, girl. You're rockin' it! LOVE that story at the end of your post! Humbling moment, right??? We've all lost complete control at the grocery store at one point or another - you're doing a FANTASTIC job :) See you tonight, friend! I have 3 littlest myself. Ages 4, 2 and 8 months. I often feel like I'm messing it all up! I lean on The Lord ALL day and He helps me see the beautiful in my chaos...and I wouldn't change a thing. Thank you for the reminder!